A quick analysis of Sephora’s app, mobile web and omnichannel innovation, shows mobile “makes up” an important part of the cosmetic retailer’s digital strategy. Half of Sephora USA Inc.’s digital traffic stems from mobile devices, Sephora was one of the first to launch Apple Inc.’s expedited mobile checkout platform Apple Pay as a payment option in its app and for years the retailer has tested beacons—small sensors that track consumers’ smartphones—in its stores. Virtual Artist is one of Sephora’s latest mobile endeavors. 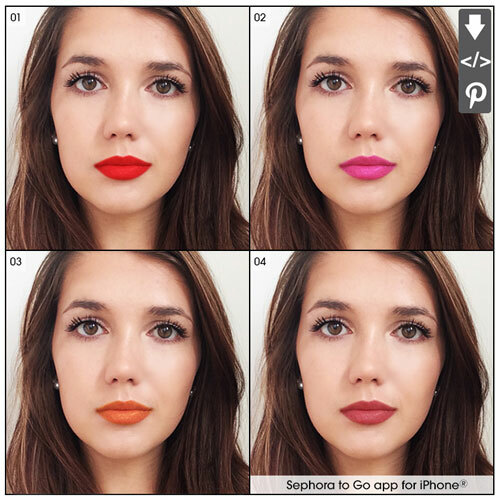 An update to its app, Sephora To Go, the Virtual Artist technology allows app users to virtually try on more than 3,000 lipstick colors that Sephora sells in app. Here’s how it works: A consumer takes a picture of herself, or uploads one, in the app, and the technology can identify the location and shape of her lips. From there she can swipe through colors to try on. “Using a state-of-the-art 3-D live view, the color moves with you like a mirror to offer a true representation of the look,” Dolan says. To further customize this, Sephora offers a way to narrow down the lipstick options to ones that would complement a consumer’s skin tone. At stores, a consumer can use Sephora’s Color IQ handheld device to find her Pantone Color IQ number. The device categorizes 110 skin tones. A consumer can also see the skin tones on Sephora’s website or in app and select the one closest to her skin tone. She can then plug that number into the app to view a list of coordinating lipstick colors, Dolan says. Virtual makeover technology vendor Modiface Inc. developed the feature. Dolan declined to comment how much Sephora invested in this new technology. The app also has a store mode, which is meant for consumers to use while they are shopping in a physical Sephora store. In this mode, a consumer can scan a product to read its online reviews and view ratings, Dolan says. She can also quickly access Beauty Insider, Sephora’s loyalty program, to see the number of points she has or if she has pending rewards she can use. Sephora also uses push notifications, or smartphone alerts, through its app to send messages to consumers not in stores about new products or Sephora events, Dolan says. Dolan declined to say how many app downloads the Sephora To Go app has. On Google Play, the app has at least 500,000 downloads. Sephora is No. 170 in Internet Retailer’s 2016 Mobile 500 Guide. Sephora’s 2015 mobile sales were $73.6 million, which includes sales via smartphones, tablets and apps, Internet Retailer estimates. Sales via mobile devices grew 60% year over year for Sephora and now make up 26% of Sephora’s digital sales, according to the guide. Can augmented reality reinvigorate one-time e-commerce darling Fab?